Sizinle 2000-2001 yıllarında yapmış olduğumuz outplacement çalışmaları işyerimize verimli çözümler getirmiştir. Halen birlikte çalışmalarımızı sürdürmekte olup, teşekkür ederiz. 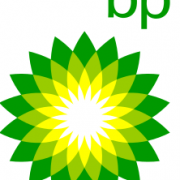 Ömer DORMENCMA Türkiye Performans Ünitesi Genel Müdürühttp://www.bp.com/tr_tr/on-the-road/turkey.html – BP Petrolleri A.Å�. I am pleased to see that our Outplacement Project has been successfully completed. I am very impressed by your positive and professional approach. DBM tools turned out to be very professional and effective. Hope these tools can also be used for other purposes then outplacement. I would like to thank you for your efforts and partnership approach. Umran ALTUNKAYATraining & Development Manager Citibank N.A. Istanbulhttp://www.citibank.com.tr/gcb/turkish/index.htm – Citibank A.Å�. 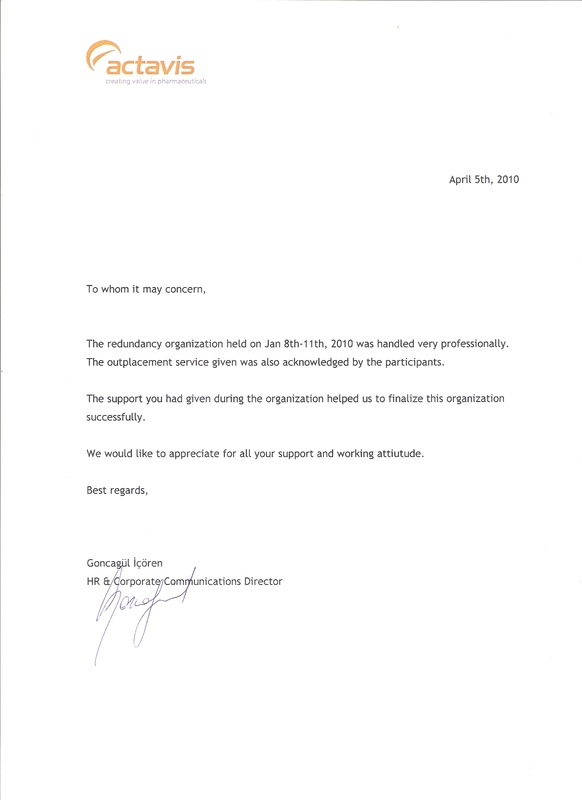 I would like to express my appreciation for your support and contribution that you have demonstrated during our Strategic Organizational Alignment back in early 2000. The process as a whole was not only painful but also frustrating for the Company and the associates. However, having DMB on board during that time made a significant contribution and support to the difficult process. 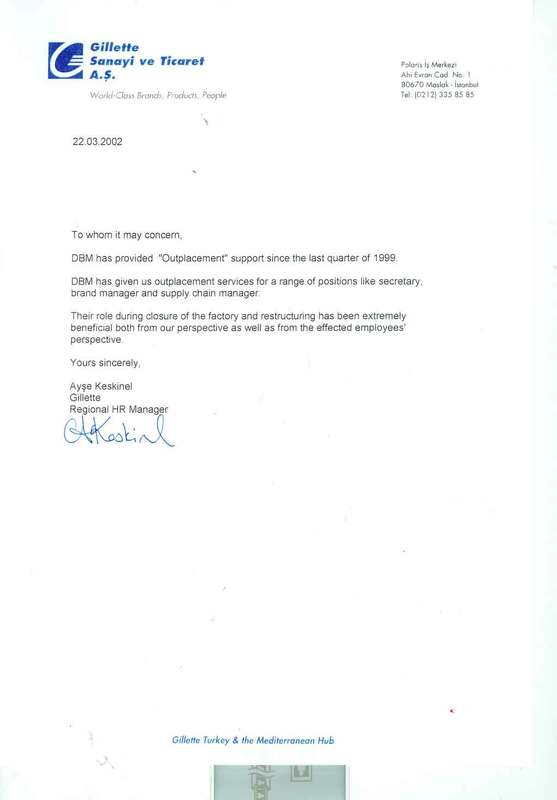 DBM has provided “Outplacement” support since the last quarter of 1999. DBM has given us outplacement services for range of positions like secretary, brand manager and supply chain manager. Their role during closure of the factory and restructuring has been extremely beneficial both from our perspective as well as from effected employees’ perspective. 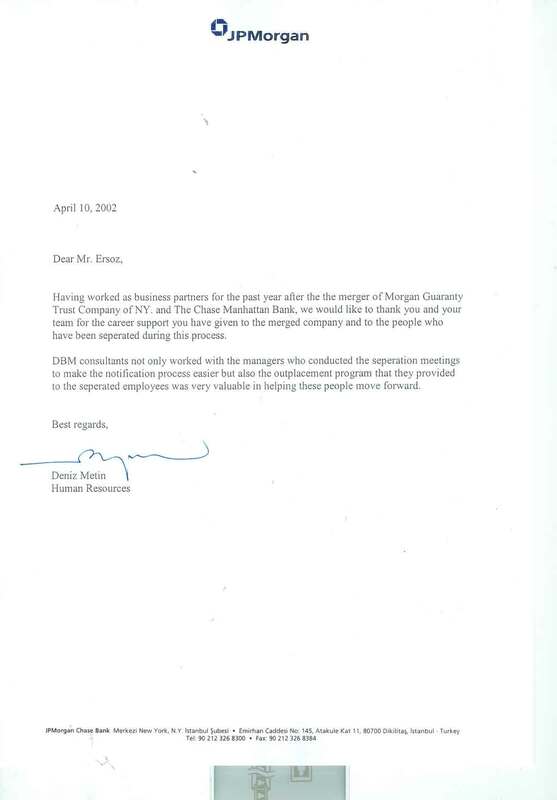 Having worked as business partners for the past year after the merger of Morgan Guaranty Trust Company of NY, and The Chase Manhattan Bank, we would like to thank you and your team for the career support you have given to the merged company and to the people who have been separated during this process. DBM consultants not only worked with the managers who conducted the separation meetings to make notification process easier but also the outplacement program that they provided to the separated employees was very valuable in helping these people move forward. 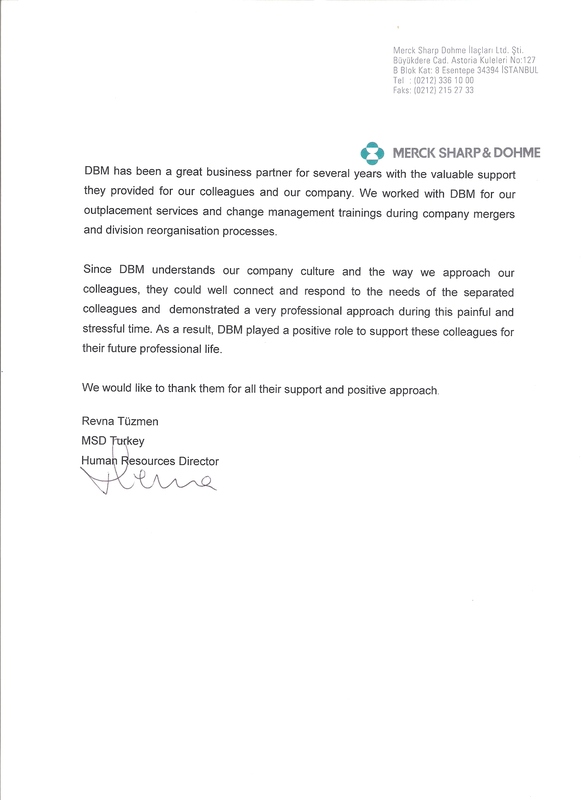 To the name of NCR Turkey, I would like to express my sincere thanks to DBM for the career support you have provided during the restructuring of our organization in 2001-2002. Even though the service is named as “outplacement”, it was a special exercise for our 8 associates who personally expressed that “it very well worthed to go through such an orientation process and they gained also a valuable asset that they will use for the rest of their lives”. I also personally thank to Zuhal GÜRBÜZ for her dedication and personal contribution to make the whole process a success story. I would like to thank you and your team for the support you have given during the downsizing process that we went through in 1999. DBM helped to make the transition process as smoot as possible. The outplacement program, which was the first one in Turkey for blue collared employees, was very valuable in helping these people move forward. 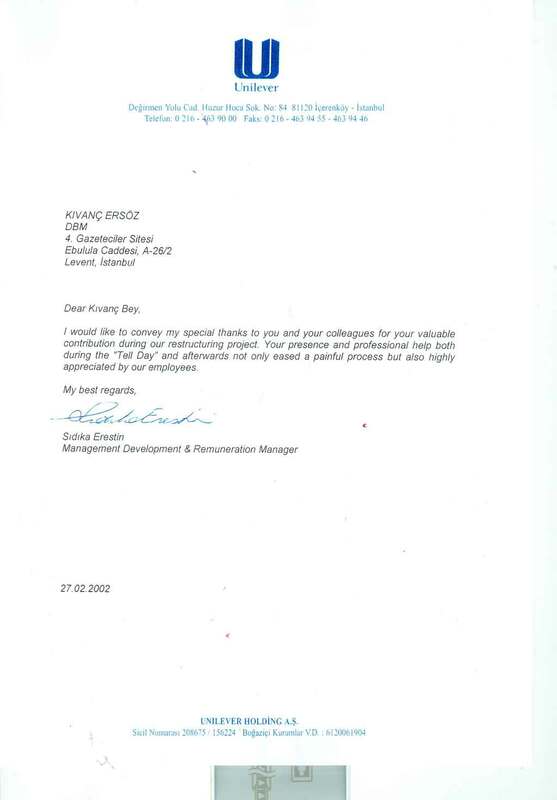 We as Nortel Networks / Netaş HR Division had worked with DBM – Turkey for an outplacement program last summer. 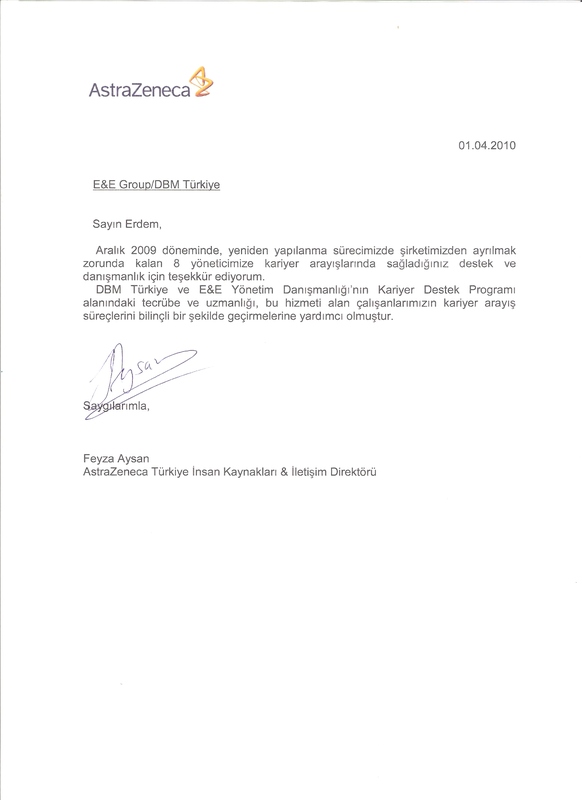 We had received meticulous services for DBM – Turkey during the process. DBM – Turkey has not only shown their professionalism during exercises but also acted as solution partner taking into the consideration our specific needs and requirements. The participants had rated the program as highly useful for their needs and found practical ways to implement. I personally and strongly suggest their services and would like to thank to Mr. Kıvanç Ersöz and DBM-Turkey team members for delivering such a high quality services. 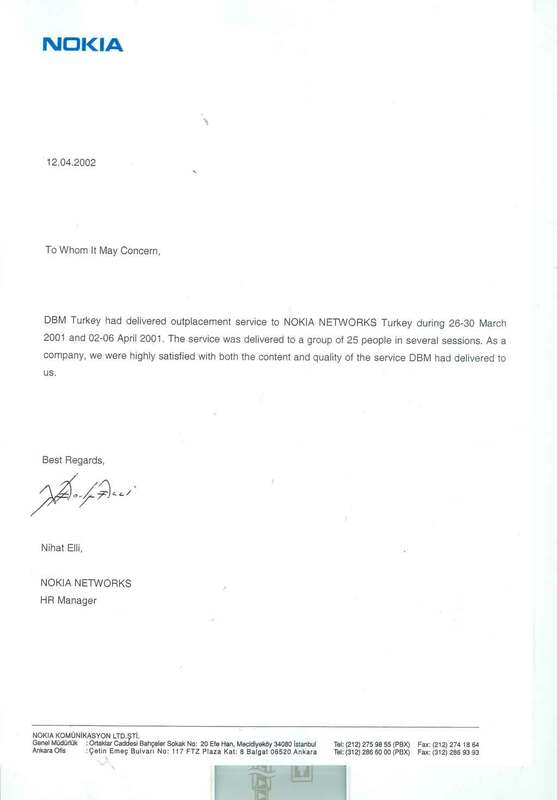 DBM Turkey had delivered outplacement service no NOKIA NETWORKS Turkey during 26-30 March 2001 and 02-06 April 2001. The service was delivered to a group of 25 people in several sessions. As a company, we were highly satisfied with both the content and quality of the service DBM has delivered to us. This was our third opportunity to work together. Once again, we appreciate your expertise and valuable guidance throughout our merger & restructuring process. 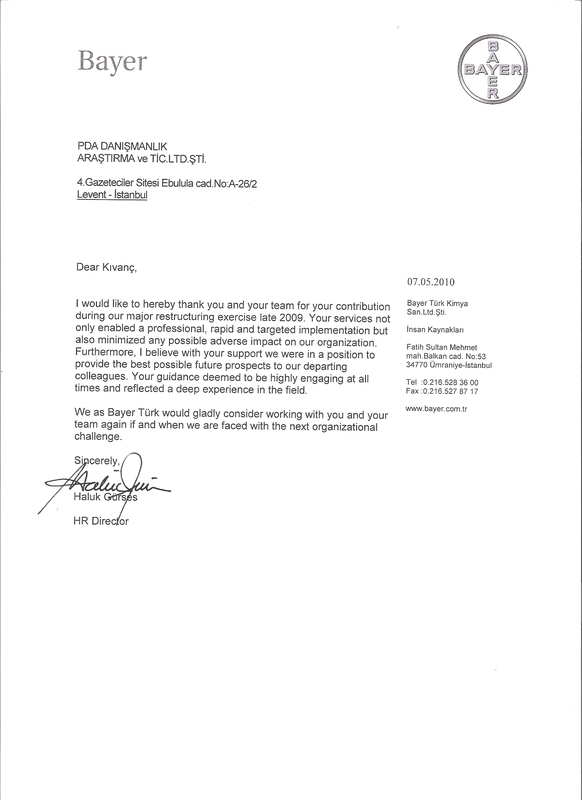 Thank you for your professionalism with focused personal touch and care for people all the way. 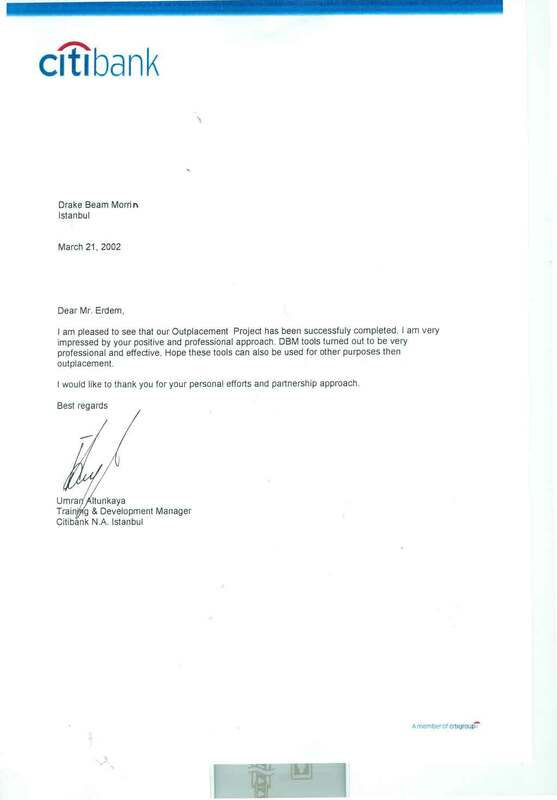 Due to the layoff of our 13 personnel in August 2000, we initiated a Group Separation Program with Drake Beam Morin (DBM). The program constituted a notification workshop with manager who handled the process, a guidance and coaching workshop with the separating employees and a job search and placement phase. 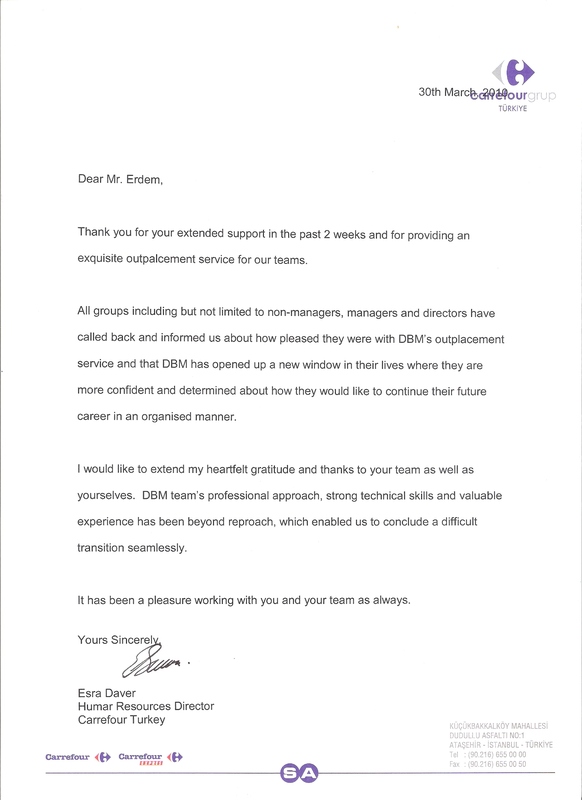 I am happy to share with you the success of our partnership with DBM. Should you have any questions, please don’t hesitate to contact me.